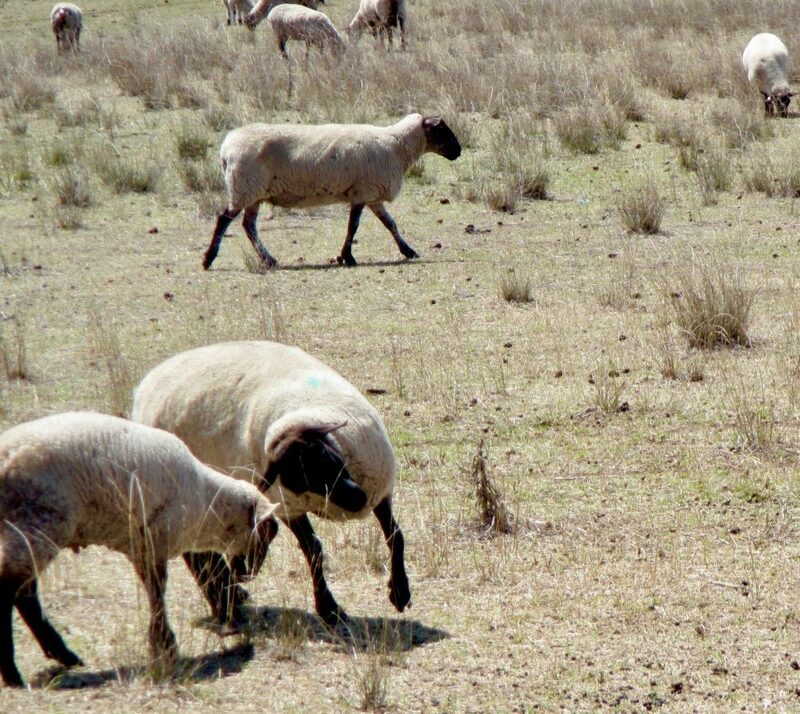 The last of our 2017 garlic crop is being shared with the sheep, as we tidy up the shed and prepare for the 2018 crop. Fingers crossed it will rain soon! Sad times at the farm as the drought grips, there’s a few olives scattered across the grove but with no water the fruit hasn’t fully formed. 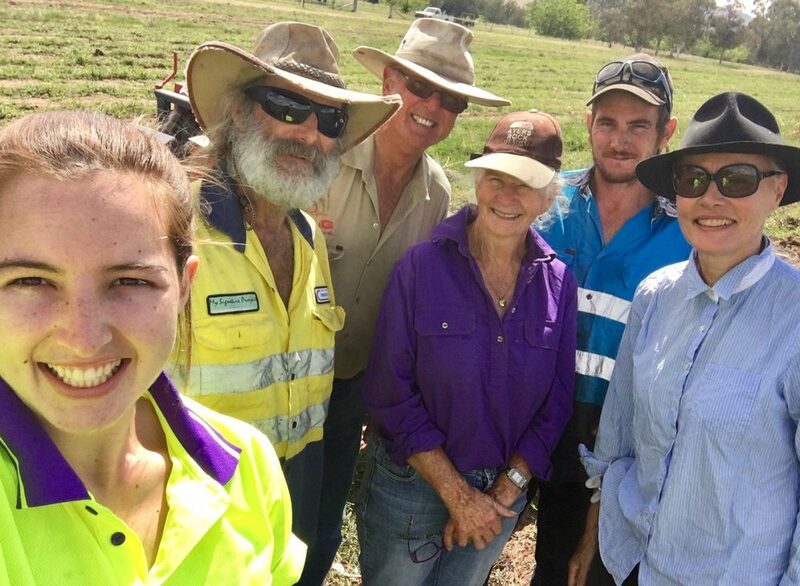 If we do get rain soon we should at least be able to pick some for table olives. 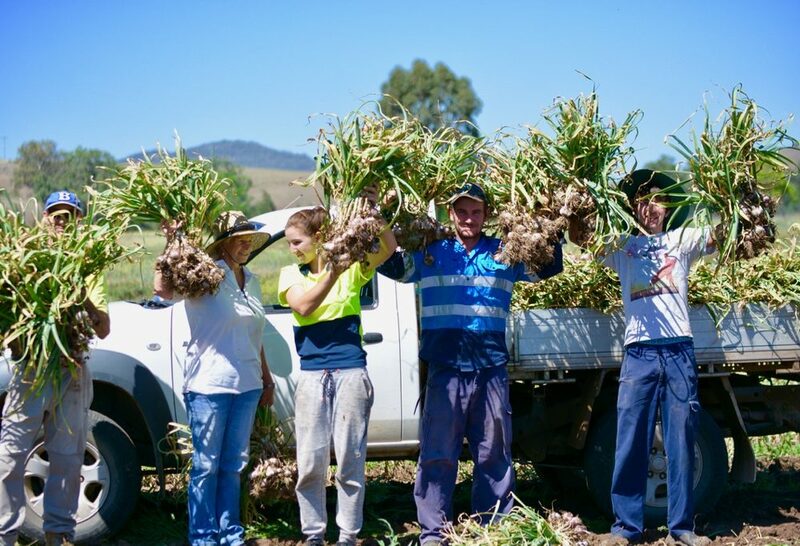 Finished harvesting all the 2017 garlic crop today! 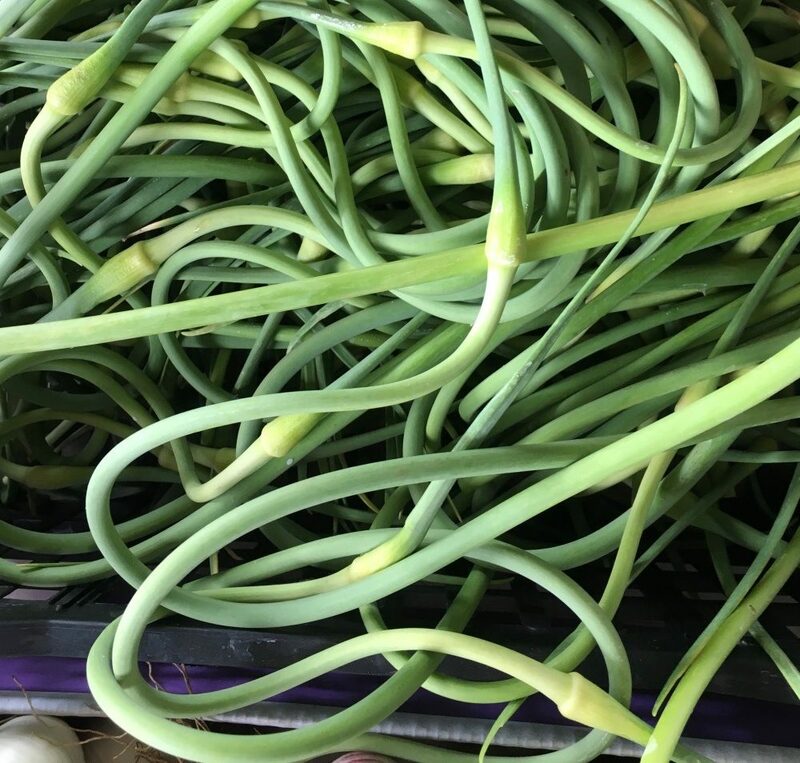 It takes a while for all the different garlics in our test beds to do their thing……finally they have shot up their scapes and are ready to harvest. 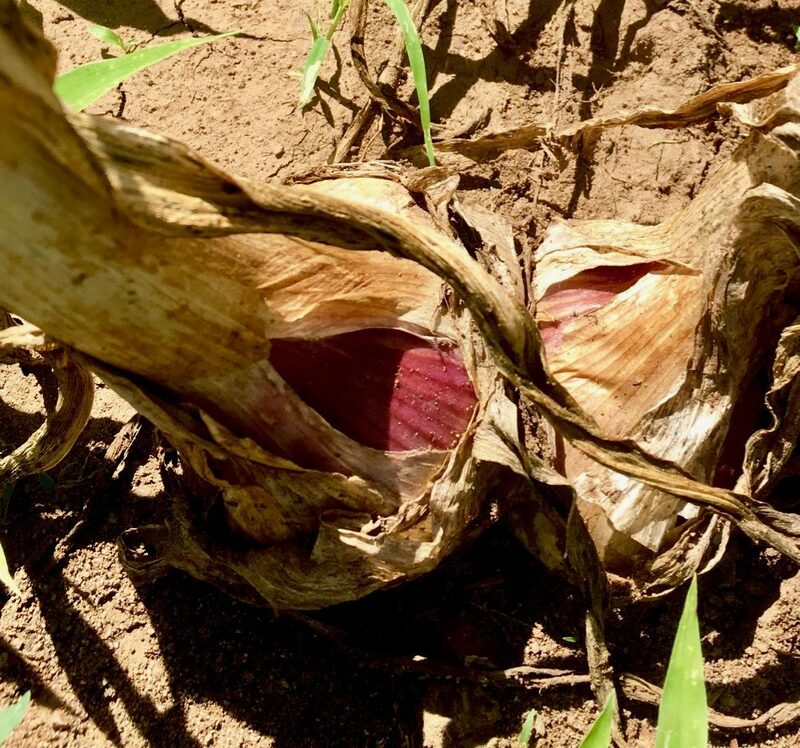 Peeling back the outer bulb skins is always a great pleasure at this time of the garlic season. How are those cloves inside? What colour are they? Every year they vary. 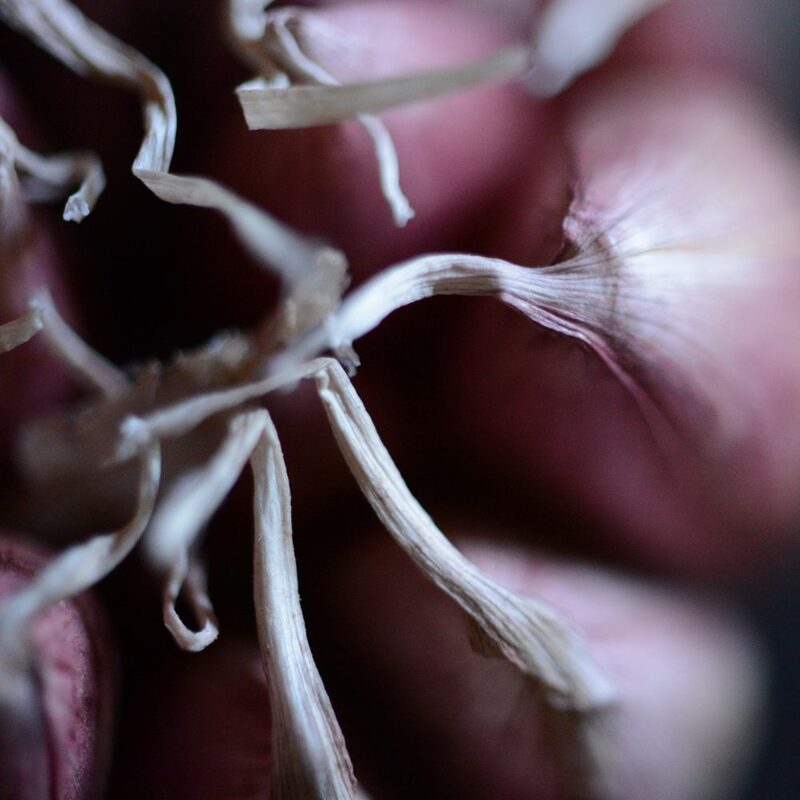 This year we’re thrilled with the way the garlic is curing. 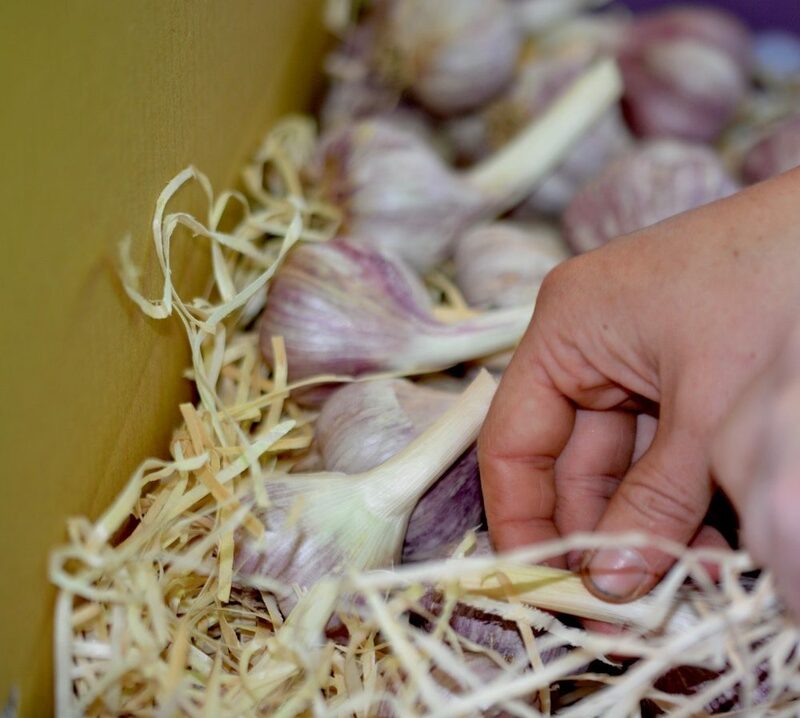 Big garlic = big bunches = very very heavy bundles of gorgeous garlic to move to the shed. No need for the gym out here! Here are two purple glamour bulbs – a little too close to gether, pushing upwards to fill out. At this time of year the growth of the bulb is amazing. Scapes.To leave or not to leave on? People often ask if they should leave the scapes on or cut them off? We leave them on unless we’re eating them! Here are some freshly picked Purple Glamour Garlic Scapes. 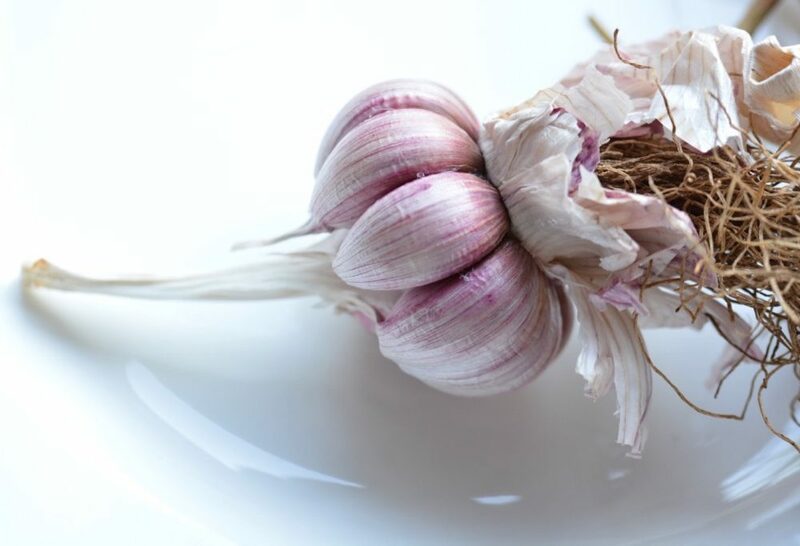 The shape is referred to as a turban, hence this garlic classified as a TURBAN variety. 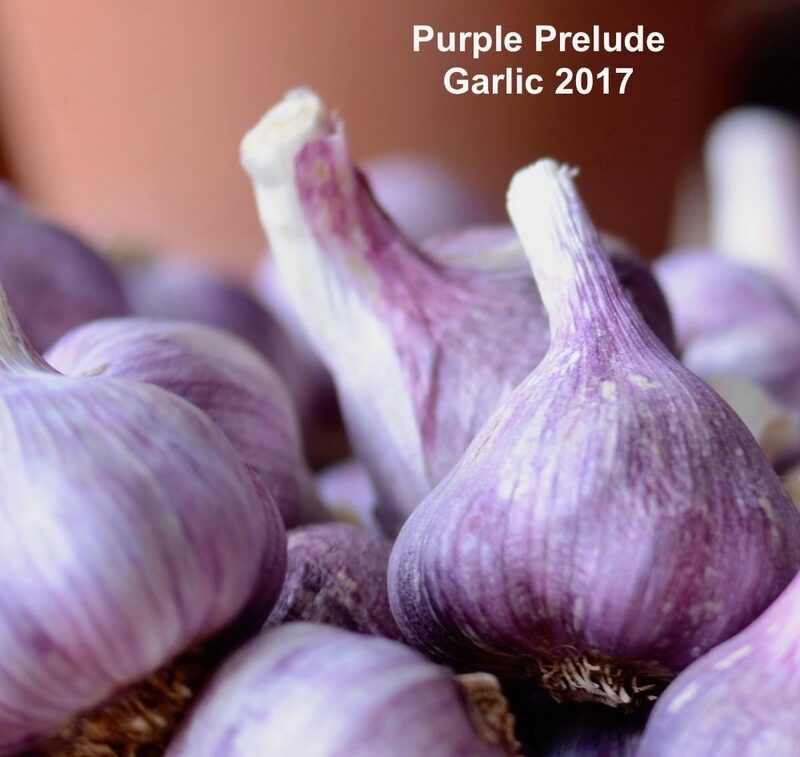 Our signature Purple Glamour Garlic harvest is underway! 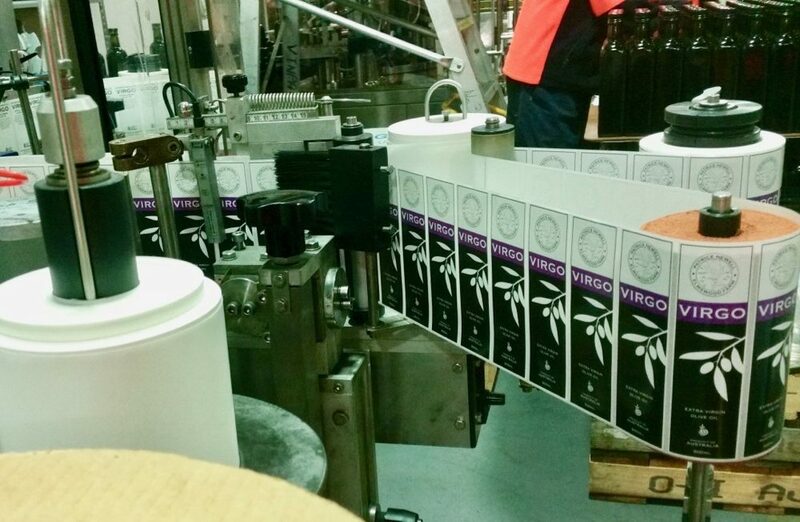 This is our main variety. The star of our garlic show. I’m addicted to it. 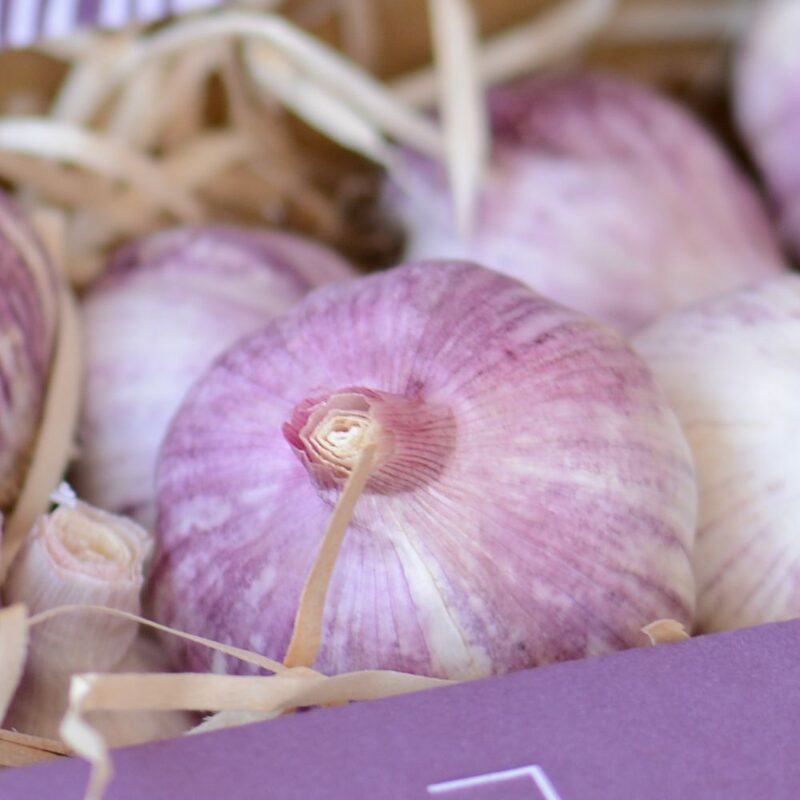 It’s a generous bulb, good clove size, with skins that peel easily and is sweet sweet sweet when baked. 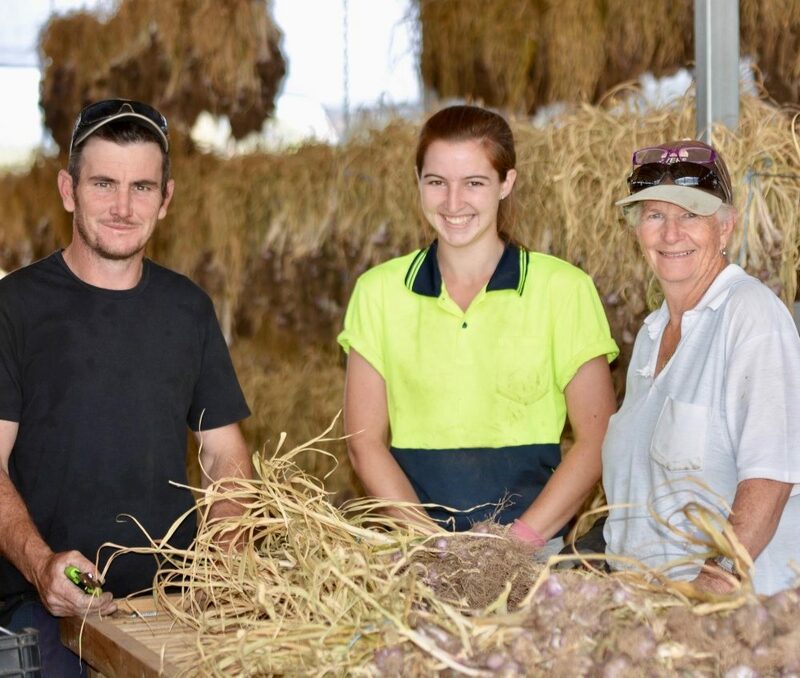 It takes a team to get our gorgeous garlic to you…John, Ivy, Betty. Thanks. Every bulb is really a ball of goodness. A privilege to post to good food enthusiasts! Many Thanks.